Sidewalks are overflowing and the bike network still doesn’t provide safe access to the biggest job center in the city. Between 34th Street and Central Park, east of Eighth Avenue and west of Second Avenue, the only protected bike lane is the southbound route on Broadway. And it looks like DOT has no plans to change that. 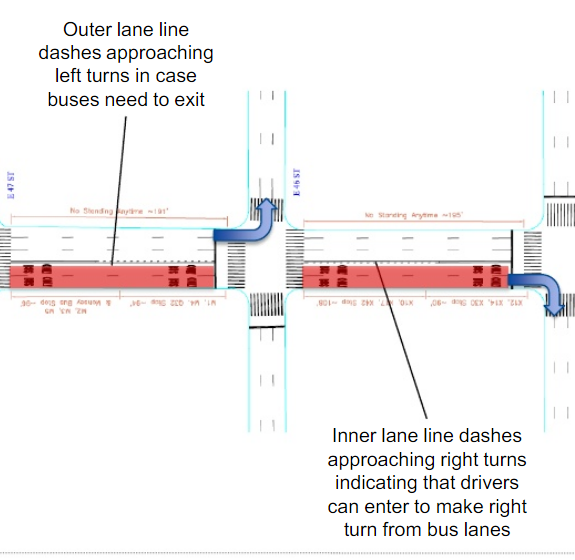 At a Community Board 5 transportation committee meeting last night, DOT presented a project that would add a second bus lane to Fifth Avenue in the Midtown core [PDF]. Improvements for biking and walking were absent from the agency’s proposal, however, and for several committee members, as well as a room full of volunteers with Transportation Alternatives, that was a glaring oversight. Four years ago, CB 5 passed a resolution asking DOT to study transit priority, protected bike lanes, and pedestrian improvements on Fifth and Sixth avenues. While Sixth Avenue got a protected bike lane up to 34th Street in 2016, and DOT added protection to the Fifth Avenue bike lane below 24th Street this summer, the agency still hasn’t extended a safe, north-south bike route through the heart of Midtown. “There is no safe route to get to that area for cyclists and it is somewhat miserable for pedestrians,” said Greenwich Village resident Janet Liff, a leader of TransAlt’s campaign for complete streets on Fifth and Sixth. The existing Fifth Avenue bus lane carries about 75,000 bus riders each weekday, making it by far the most intensively used of the street’s five travel lanes. DOT is proposing a second bus lane between 61st Street and 34th Street to further prioritize those trips and speed up transit travel times. Liff and about 30 other attendees urged the committee to make its support for the bus lane expansion conditional on the inclusion of protected bike lanes. DOT Manhattan Deputy Borough Commissioner Ed Pincar said the agency would look into protected bike lanes but offered no concrete commitments. The committee ultimately voted 10 to 6 endorse the bus lane expansion without conditions. While the project will make bus trips faster, DOT’s hesitance to create a cohesive network of wide sidewalks and protected bike lanes in the busiest part of town is wearing thin. “It’s just not good enough any more that the answer is still ‘maybe in the future,'” said committee member Jesse Laymon. It would be one thing if DOT released a study that showed dire consequences for making further changes to the infrastructure. But such a study was asked for, years ago, plus a petition with 10,000 signatures asking for major street makeovers. Definitely but I think they want 11′ for better clearance when buses pass each other, and we want a *protected* bike lane instead of just some paint that will certainly become the defacto Uber lane. Realistically if we want a PBL, it’ll be 2 bus lanes, a travel lane, and a parking lane, OR we’ll have to convince DOT to do bollards (and concerns have been raised about accessibility). Though we do have bollards on 8th between 42nd and 43rd and they’re quite nice. Until Manhattan stops being clogged with motor vehicles, it’s going to be miserable for cyclists and pedestrians no matter what DOT does. A PBL might be a slight improvement over the status quo, but it can’t negate all that congestion, especially at intersections. If you want to make things a lot better, then we need to reduce the volume of motor vehicles in Manhattan by at least 75%, better yet 90%. After that, reallocate space for bus lanes, bike lanes, widened sidewalks. Also get rid of most of the traffic signals which delay both pedestrians and cyclists. Of all the places in the US, Manhattan is probably where it makes the most sense to aim for an environment as free of motor vehicles as possible. Indeed, a car-free Manhattan has been talked about from before I was born. We should aim to make it a reality. I was at the meeting last night and it was pretty interesting. Basically someone who worked on transit-specific DOT projects came to propose improving bus flow, and was met with fierce opposition — not because of removed motor vehicle lanes, but because the lack of a complete street plan as asked for. The good news, at least, was that nobody came to protest the reallocation of space away from motorists. The bad news was that it was very clear the the hand of DOT that handles bus lanes does not talk to the hand that handles bike lanes — and in the case of 5th, the second hand doesn’t exist. With the resolution passing, the good news is that DOT will try to rapidly implement and study much needed bus route improvements, with paint supposedly coming down in November. The bad news is that there’s now less space on 5th for safe pedestrian or cyclist projects, and we’ve basically been told nobody is even looking at that right now. I honestly feel bad for the DOT presenter, Jeremy. His presentation was backed with data and he seemed knowledgable and passionate about the topic — and given the Citibike key on his belt, I’m sure he understood the pain we all felt. But 40 years of fighting over 5th Ave caught up to him last night. I was just looking at the presentation. Not that it matters much, but don’t they have the dashed lines backwards? Absolutely, all sidewalks should be restored to their pre-1950s width. Removing or retiming signals is also needed to improve walking conditions, since as it is now a pedestrian walking south, who begins walking with the WALK sign, will have to stop EVERY BLOCK. All sidewalks should be restored to their pre-1950s width. Removing or retiming signals is also needed to improve walking conditions, since as it is now a pedestrian walking south on Fifth, who begins walking with the WALK sign, will have to wait the full light cycle EVERY BLOCK. We’ll just have to wait for a few more people on bikes to die, and the resulting protests will cause DOT to actually address this. I favor pedestrianizing the minor streets. That means no traffic signals for pedestrians or cyclists going north or south as there would be no vehicular cross traffic. You might still need signals to cross the avenues, but those would only apply to motor traffic lanes (the bike lane would get a flashing yellow yield to peds when the motor lanes get red). You’ll still have major cross streets. Those might be handled with an overpass for bikes, and perhaps also for pedestrians. This was one of my biggest shockers moving to NYC — how can the lights in Manhattan be timed so that you *have* to jaywalk to cross every other block? I mostly do my e-mail while walking home, since about 1/3rd of my time is spent waiting at the light. It’s often even worse on a bike in terms of time stopped versus time moving. If you’re totally law-abiding you might go two or three blocks between reds. That means maybe 25 to 40 seconds in motion, and up to 1 minute stopped. Small wonder most NYC cyclists jaybike when riding legally is often no faster than walking. Agreed. I normally bike 10 mph (Dutch-style), but found myself going 12-15 mph in order to keep up with the lights once I moved here. I feel horrible that I may be creating a safety hazard for pedestrians who walk into the bike lane — for all the same reasons drivers should be slowing down (kinetic energy being square of speed, reduced ability to stop in time, etc). But this is the bike design speed the NYCDOT has engineered into their streets, so why should I behave irrationally? I’m wondering if they retimed the lights because last time I rode on the Manhattan Avenues I had to ride at around 25 mph to keep up with the green wave. BTW, don’t worry too much about creating a safety hazard. 12 to 15 mph on a bicycle is still orders of magnitude safer for pedestrians than 25 mph or more in a car. It’s also way easier to stop or maneuver around pedestrians on a bike. I ride pretty fast most of the time (18 to 23 mph) but I haven’t hit a pedestrian in 39 years of riding. I usually keep aware of the situation ahead, and adjust my speed/path accordingly to give anyone crossing a wide berth. Thanks, Joe! I admit I just don’t feel that comfortable going super fast on a bike, since I’m much more acclimated to Dutch urban cycling than American biking. Plus, the pavement is often crap quality, and I’m sure I could get hurt if my little Brompton tires get stuck in a pavement gap. 100% right about the pavement quality. That slows me down more than anything else. Since you’re used to Dutch cycling and great Dutch bike infrastructure, NYC streets must seem even more crappy to you than to me. Really, the condition of the streets in this city is a source of embarrassment. Even freshly paved streets have ripples, raised manhole covers, and dips. I’m always extra cautious riding on streets I haven’t been on for while, given how quickly all sorts of pavement defects spring up. Can we please get some Dutch engineers to design and build our streets? The big news in Seattle is that they are, years behind schedule, building *6* whole blocks of protected bike lanes that are connected to nothing on either end. So I didn’t exactly ride my bike there at all. The Dutch have nailed surface quality (among everything else). 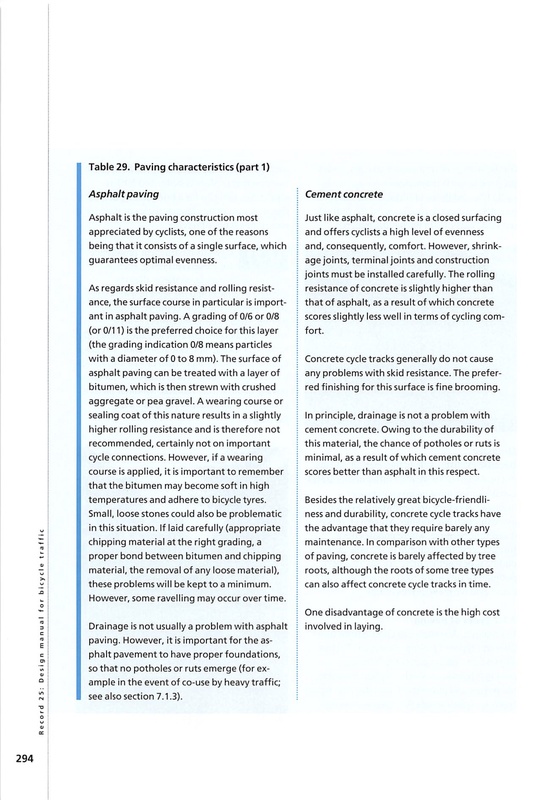 If you haven’t read the CROW (dutch bike infra manual), here’s just a sample page from the 2006 edition – 11.5 years ago. what about protecting the president from car bombs ? The lights are clearly timed for cars, with pedestrians not even an afterthought. The avenues are definitely not timed for 12-15 mph. I believe they are timed for 25 mph and used to be timed for 30 mph. If you ride at 12-15 mph, you can at least go half a mile between reds, which I don’t mind. Stopping every 2-3 blocks is another story! It happens when going against the wave on two-way avenues, or on streets, or on diagonal avenues. You’re definitely correct about the light timing. Although it’s been decades since I’ve ridden in Manhattan, when I watch recent cycling videos it appears you need to go roughly 25 mph to avoid reds. Obviously at slower speeds you’ll hit more reds. How often depends upon the cycle time and duration of the red light. Back in 1981 as a bike messenger I did a run from 125th St. to West 4th St. in 15 minutes flat. No red lights. That’s an average speed of a bit over 24 mph, which evidently was the timed speed back then. They may have increased it to 30 mph in the interim, and put it back to 25 mph after the speed limit was lowered. Light timing on most arterials in Queens is horrible for cyclists and none too good for motorists. The problem is E-W and N-S two-way arterials. It’s pretty much mathematically impossible to have any kind of timing. I’d much prefer roundabouts where arterials intersect each other to avoid issues with light timing. Having signals at only major intersections would be much more reasonable. It would be easier for cyclists and pedestrians to adjust their pace to arrive on green. I think you’re correct–I noticed the timing on one-way avenues has improved slightly since the speed limit was lowered. Shortening light cycles (which requires shortening crossing distances) would also help a lot. Fact: CM Garodnick and the Mayor have heard more about delineators on 2nd Ave than they have about the need for better bike infrastructure in Midtown. Would really like to see sidewalk expansion on 5th Ave. Just make the street bus and bike only and call it a day.